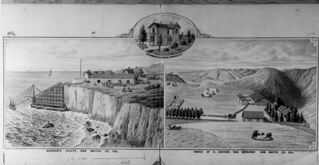 The most notorious legal contest was yet to come as the “famous San Gregorio Rancho case” was brought before the San Francisco Superior Court in 1872. Who were the legal owners? The “San Gregorio Rancho case” dragged on for a decade and affected prominent men–among them County Supervisor Alexander Gordon who built the fantastic, but ill-fated, “Gordon’s [shipping] chute” at Tunitas Chute. Judge Hunt unraveled the convoluted events and found that Antonino Buelna left a will granting two minor heirs a fifth interest in the Rancho San Gregorio. These heirs sold their interest to Hugh Hamilton–who then resold it. Later, ignoring the sale to Hamilton, the heirs sold their interest again! The whole thing was finally settled in favor of the defendants, including Alexander Gordon. Attached to the original, yellowed document that relates the story I just told you–is label that reads: “1247 San Gregorio R. formerly Santa Cruz County now in San Mateo Co.” Perhaps this document was entered as evidence in the famous San Gregorio Rancho case. Possibly it was simply a detailed records of land transactions of the Rancho San Gregorio. The document covers critical years in California and Coastside history. California became a state and the rancheros were driven out…..
Photo: San Mateo County History Museum. Please visit the museum’s new exhibits at the historic Redwood City Courthouse in Redwood City.